The Kyiv international airport (Zhuliany) will be renamed after Ihor Sikorsky aircraft designer and Boryspil international airport after Kazimir Malevich (both based in Kyiv). The press service of Kyiv City Administration reported that Deputy Chairman of Kyiv City Administration made the announcement at a roundtable devoted to Malevich. "On June 6 a meeting of the commission for renaming was held. I am the co-chair of the commission. The agenda included the renaming of the Kyiv airport after Sikorsky," he said. 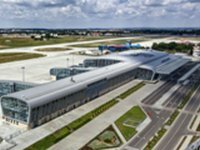 The administration said that the idea of renaming the Boryspil international airport after Malevich was supported by the public.